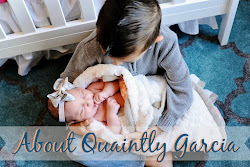 Quaintly Garcia: Samantha is 4 months old! Samantha is 4 months old! I can't believe this little lady is already 4 months old! She now weighs 13.9 pounds, and she measures 25 inches. Samantha can hold her head up, sits up with assistance, has begun turning over, and has discovered her voice (she screams at the top of her lungs for no apparent reason). Her personality is starting to show, and it's absolutely adorable!